This month, we’ll stay in the Health and Fitness framework and give our brains a work-out by learning more about the glorious Garden State. As the New Year begins, why not make the resolution to learn more, see more, and experience more of what makes New Jersey great. New Jersey played a key role in this nation’s history. Monmouth County has some of the oldest historic destinations in the nation, all within a short drive. The state’s rich culture celebrates the sea, the soil, religious, and political freedoms, celebrities, science, and even some scandal; after all, this is New Jersey. 1) Old First Church, 69 Kings Highway in Middletown. For details, visit oldfirstchurchnj.org. 2) The Museum of the Historical Society of Ocean Grove, 50 Pitman Ave., Ocean Grove. For details, visit oceangrovehistory.org. 3) Monmouth Battlefield State Park, 16 Business Route 33, Manalapan. For details, visit https://www.state.nj.us/dep/parksandforests/parks/monbat.html. 4) Lucy the Elephant, 9200 Atlantic Ave., Margate. Just minutes outside of Atlantic City stands a six-story elephant named Lucy, and she can’t wait to meet you. Lucy is a true one-of-a-kind. For details, visit Lucytheelephant.org. 5) NJ Vietnam Veterans’ Memorial and Vietnam Era Educational Center, 1 Memorial Lane, Holmdel. For details, visit njvvmf.org. 6) The Historical Society of Ocean Township at the Eden Woolley House, 703 Deal Road, Ocean (adjacent to the library.) This unique museum utilizes its artifacts and treasures in a real home setting. There is a school, kitchen and lots more, plus rotating exhibits. For details, visit oceanmuseum.org. 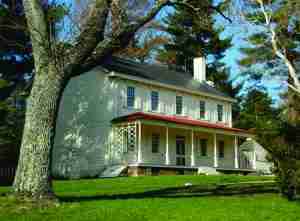 9) Walnford House in Upper Freehold. See over 200 years of social, technological and environmental history through the Waln family. A walk through the site reveals buildings and structures that illustrate its progression as a mill village, working farm, and manor estate. The Colonial-era Waln House will impress both casual and studied fans of architecture. There are demonstrations and events on many weekends from 1 to 4 pm. Call 609-259-6275. 10) Kingston Mill Historic District in South Brunswick is made up of the Greenland–Brinson–Gulick farm, four nearby houses, the gristmill powered by the Millstone River, and the Kingston Bridge, an 18th-century stone arch bridge over the river. 11) Murray Farmhouse and Barn, 345 Oak Hill Rd. in Poricy Park in Middletown. For details, visit https://ppc.wildapricot.org/Murray-Farmhouse-&-Barn. One of the great introductions to area history is the Monmouth County Park System’s “A Weekend in Old Monmouth.” Dates for 2019 have not been released, but the event is traditionally held on the last weekend of April. During this weekend, nearly all the historic sites throughout Monmouth County open their doors – all at the same time – to visitors with an interest in local history. Admissions are waived during the event, and most locations feature costumed characters who tell you all about the history of the location. Many also have demonstrations and activities, making it a great way to sample lots of historic places in just a few days. The park system has many historic-themed events throughout the year, so visit monmouthcountyparks.com often to see what’s happening. Should you wish to really get involved in preserving history, there are a number of wonderful historical societies that you can join. The Monmouth County Historical Association collects, preserves, and interprets its extensive museum, library, and archival collections that relate to Monmouth County’s history and culture, and makes these resources available to the widest possible audience. They are always looking for volunteers, and the ways to lend a hand are diverse, from becoming a costumed demonstrator, or a docent, to an archivist, there’s something for every personality. Visit monmouthhistory.org to learn more. Shrewsbury has a particularly active and friendly historical society. Attend one or two meetings and you will meet many knowledgeable members full of very interesting tales of the area, some even star-studded. Visit shrewsburyboro.com/historical-society. The Atlantic Highlands Historical Society at the Strauss Mansion Museum is another very active group. They are located at 27 Prospect Circle in Atlantic Highlands, in the Strauss Mansion, which celebrated its 125th anniversary in 2018. The mansion is open Saturdays and Sundays from noon to 5 pm, and for those of you looking for a little thrill and chill, the mansion is considered to be an actively haunted location. Another must visit for history hunters is the Monmouth County Archives, a gold mine of historic records and photographs. Many are unfamiliar with the volumes of data available, including some of the oldest documents in the state, and they are always looking for volunteer archivists. Visit co.monmouth.nj.us and look under archives to learn more. Ours is a very rich history, including Indians, settlers, nautical history, the Revolutionary War, rum-running in the Prohibition era, World Wars I and II, and so much more. Let you mind wander. Imagine life in all those different times, and think about what those earliest of residents would think of the New Jersey we know today. History is all around us; explore and enjoy.